Form meets function with this modern hiking shoe by Vasque. The Mantra 2.0 gives you stability-providing midsoles, quality Vibram Nuasi outsoles, and durable nubuck and mesh uppers. The Mantra's Perpetuum last creates a comfort fit that makes it highly suitable for long-distance hikes. Available with or without a Gore-Tex liner, it's ready for walks in the park or walks into the wild. As the name suggests, the Mantra's Perpetuum last creates a fit for steady, long-distance endeavors. The straighter line of this last is comfortable for people with flatter feet, while the tailored instep and lower-volume heel keeps your foot securely in place. It also features a wider toe box to accommodate natural foot expansion during 10K, 50K, or even 100K runs. The Mantra 2.0 features a Vibram Nuasi outsole that gives you the durability you need for long-distance hiking. Partners for many years, Vasque works with Vibram to produce quality soles with innovative designs. The nubuck and mesh uppers increase the durability and comfort of this shoe. 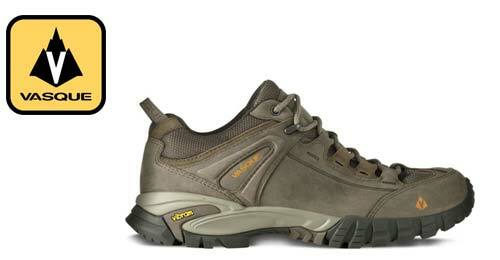 A GTX version of the Mantra is available with Gore-Tex waterproof technology. The breathable GORE-TEX membrane, water repellent laces, and seam sealing technology keep water and moisture out, ensuring a comfortable, relaxing hike--whatever the weather. Vasque is committed to making functional, innovative, and aesthetic footwear that performs to the highest standards. Founded by recreation enthusiast William D. Sweasy in 1965, Vasque has been producing high-quality mountaineering and hiking boots for over forty years. From the original Voyageur boot to today's technically innovative and stylish designs, the Vasque trail continues today, breaking new ground toward what's next. Vasque Men's Mantra 2.0 Hiking Shoes. 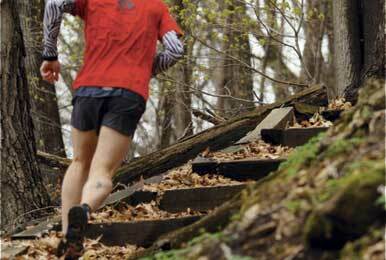 Create a fit for steady, long distance endeavors.